The film won the Jury Award at the 39th Annecy International Animated Film Festival. At the Fantasia International Film Festival it won three awards: The Séquences Award for best Asian feature film, the Satoshi Kon Award for best animated feature film for excellence in animation, and the Gold Audience Award for best animated feature film. At the 19th Fantasia International Film Festival, it won the Gold Audience Award for best animated feature film, the Satoshi Kon Award for best animated feature film, and the Sequences Award for best Asian feature film. It also won the 2015 Asia Pacific Screen Award for Best Animated Feature Film. Sarusuberi is not a film I believe anyone can enjoy, but I have no reservations about calling it a work of art. Not only is it a beautiful film overall, the experience it provides in both its characters and its setting is poignant and thought-provoking despite its straight-forwardness, something that is regrettably rare in major feature-length anime releases. Sarusuberi has neither a main conflict nor a linear narrative, instead made up of a handful of shorter stories that are loosely held together by O-Ei, the film's central character. It is difficult to asses the story's effectiveness, because there isn't really a particular "goal" that it tries to achieve, thus no tangible criteria to judge it against. I did think, however, that each section of the movie had something of interest in it, was well-paced, and never felt pointless. The format also leads to the overall tone of the completed film being very subdued, with virtually none of the melodrama one would expect out of an anime. Where the movie gets its flair from are, in my opinion, the art, as well as the masterfully done sequences of magical realism woven throughout. There aren't many, but when they do appear these sequences are breathtaking, effectively adding some variation in what could have easily become a monotonous film. Due to the lack of a real plot, it's also difficult to asses the film's characters. While there is little development for most of them (though O-Ei does receive some, subtly but powerfully so,) it can also be said that they aren't really meant to undergo much development in the first place. All I can say is that I believe the film is meant to be experienced with the characters rather than following them as they try to get from Point A to Point B, and for this purpose most of the characters are interesting and unique (though not always likeable, which in my opinion is a good thing), even though some appear only briefly. The animation, art, and sound in this film are all exceptional. Perhaps due to the presence of O-Nao, O-Ei's blind sister, this film is truly a sensory experience. So much attention is paid to the details in the scenes where she appears - everything from footsteps, the crackling of woven grass, the creaking of a great wooden bridge - that it adds a touch of realism to the animation. A number of scenes delightfully weave some of Hokusai's actual art into the visuals, creating some of the most potent scenes of the film. Edo period Japan is crafted so immersively that it would be a joy to watch the film even for just that purpose. The only thing about this movie I'm not sure that I loved was the music. The film makes use of a more traditional orchestral soundtrack, with sections using traditional Japanese music, and, strangely, in a couple of scenes, electric guitar riffs. While I understand what the film could have been going for - perhaps showing O-Ei's character at odds with the norms of her time, I found it rather jarring to hear. Not all will have the patience for or the interest in this kind of film, but I would recommend Sarusuberi to fans of historical anime, animation, and subdued slice-of-life shows of the non-moe variety. It is a beautiful, subtle, intelligent film that doesn't try too hard to be any of those three, which is what, I believe, makes it so excellent. While the vast majority of people must have heard at least one time in their life about Hokusai, the famous painter, little of them know about his talented daughter, O-Ei. So, maybe now you are interested in knowing the life of this mysterious unknown woman? Maybe you want to see the movie to find the truth and discover her life from her young age to her death...well, if that's the case, you might end up to be a little disappointed by this movie ^^ . 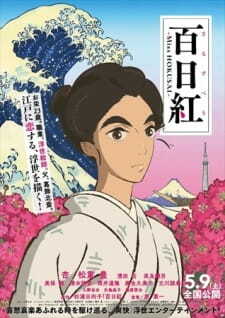 See, Miss Hokusai, while being centered around the figure of O-Ei, isn't about her life, instead the movie take the gamble to opt for a slice of life aspect, developing around little separated scenes involving the little crew of marginal painter composed of Tetsuzo (more known by the name of Hokusai) the monolithic eccentric artist, and his disciples, including O-Ei. The movie also didn't chose to make the relationship daughter-father into a central aspect, and the hint about the link of the two character is discreetly spread through the movie instead. First the one including Hokusai, one of his slightly drunken disciple (provider of some of the comical aspect of the movie) and O-Ei. These moments follow the crew involved in problems and mystery that they will solve with painting. In them, some supernatural and fantastic aspect are surprisingly very present, would it be a menacing dragon lurking in the dark clouds of the sky, or the spirit of a geisha coming out of her body at night. In them, we discover O-nao, the younger sister of O-Ei, who had the misfortune to be born blind. These moments, with O-Ei walking around, "showing" O-nao the living life of the people traveling a pond, or listening to the silent in a snowy day, are very meaningful and powerful moments. In fact, those moments reveal one of the best quality of this movie: the emotion is never expressed directly in a frontal way, with heavy talk and shows of tears, but by little touch, when O-Ei warmly touched her sisters little hands or when the screen simply took the time to show us her face, slightly smiling looking at her younger sister playing in the snow, discovering the discreet wonders of everyday life. The relation between O-nao and her father, never showing up to her, is also a very impactful aspect of the movie, even if never addressed frontally. But what about the music? Well it might be the weakest point of the movie. The movie take the bet on using rock instrumental music and sound, surely to try to emphasis on the modernity and strong whiled feminism of O-Ei...and while the intention is visible, the result don't match and feel out of place. Other than that, the sound and music are quite rare and most of the time the scene will be composed of the character talking without ambient music or much sound, which accentuate the slow pacing of the movie (while it's not really a default, it should be mentioned for those reluctant to watch a movie without action like this, that they might find boring). I didn't talked much about O-Ei in herself, but even if I might have made clear that the movie is not really about developing her character or make us enter in her life completely, she stays a very refreshing and free woman, a type of character that is not that often seen in anime, and it's also one of the good points of this movie. To summarize: if you like slice of life anime, if you want to take a look and feel what life in the end of the Edo periodeperiod was like, then you should watch this movie and will surely enjoy it. Thank you for reading this review to the end. Fair. The story was fair. It didn't have much of a focus, but this is to be expected. It features several arcs and has a couple of characters that interact with each other. Yet there is barely any progress or character development. The characters were realistic, yet it wasn't a story. It was a series of events that happened to somebody in a chronological order with no theme or message. The only arguable theme is to stop being afraid of death, yet there was so little focus on it, it can be barely called that. However, Onei's relationship with her little sister, Onao, is quite touching. I almost cried. But as it failed to make me actually cry, it was alright. That small story is the only thing that somewhat redeems this movie. However, with so many arcs going on in the story, an ongoing series would suit the subject matter better. Despite its focus on traditional Japanese arts, the art was mediocre. The style wasn't something I liked, nor was it overly complicated or pretty. Several times some scenes were lacking too much in detail for it to be a movie made in 2015. The animation has way too many still scenes, often very confusing as I have to check if there was anything wrong with my computer while watching it. Had they chosen a different art style - perhaps one that has a watercolour feeling similar to Legend of Kaguya, it would have been much preferable to this bland mix. The soundtrack can only be described as terrible. As a story set in 1800's Japan, someone would expect a more traditional soundtrack with minimal electrical sounds. However, we are introduced to the opening scene with an electric guitar as a background. During one of the last climatic scenes featuring Oei running, the electrical guitar played, creating a somewhat ridiculous effect. The soundtrack wasn't just bad, it was disorienting. It takes the viewer out of the setting of the story back into our lives in the modern world. When any good movie should let the viewer forget about their life, the soundtrack choice for this movie was more than appalling. However, there are very rare moments when the soundtrack sounded nice, preventing it from getting a simple "1" for its score. Overall, it wasn't a good movie. The soundtrack was terrible, the animation was mediocre, the story lacked focus, the characters didn't get properly developed, and the art style just might not be your cup of tea. 4/10. And that's being generous because it almost made me cry. “nineteenth century Japan was a culturally dynamic society with much in common with its present-day counterpart. Many artists of the time, starting from Hokusai and his daughter O-Ei, had personalities and lives more interesting than any novelist could conceive." depicting the life of Katsushika Hokusai, Sarusuberi, however, is far more than the eye meets. the film centres around O-Ei, daughter of the extraordinary artist Tetsuzo, was a woodblock artist herself, painting with and for her father. more than just being and aging lonely man, Tetsuzo and his “cowardice”, as O-Ei so elegantly put, tends to isolate himself, even through he lives with O-Ei and his twit apprentice. O-Nao, his other daughter, blind since birth feels reluctant towards her father, thinking he might hate her, all of this because Tetsuzo has this derange with sickness, which makes him absented from the little girl. not only that, but Tetsuzo, in his mid-fifties, renowned all over Japan, paints day and night like a mad-man, making himself more and more apart from the real world. O-Ei is a devoted older sister, showing the world outside to her blind little sister O-Nao, through the touch of water, the noise of the crowd, the scent of flowers; with this comes a type of love-hate relationship with her father, who deserted home and now lives in a shabby house. simply an act of compassion or the wishes of her mother, O-Ei shares the house with her father and works with him. here you’ll find the classical bijin art and ukiyo-e paintings who fascinated people like Van Gogh. painting with her father since a child, O-Ei grows to be a fantastic artist, though, in her melancholy, it seems to have no fulfilment on her. she’s a caring person, but something seems always off. she’s a character so unique in her own way that you tend to float away with her pensiveness. this film (production i.g) gives us the young seyuu Watababe Anne-san as O-Ei, and Shimizu Shion-chan in the role of O-Nao. it’s always good to have new talents discovered. along the way you’ll find yourself surrounded by the mystical city of Edo, making the perfect scenario. since this is an adaptation of Sugiura Hinako-sensei’s manga, who was an enthusiast of the ancient Japan, i think the background art is beautifully delineated, from the snowy streets of the city, to the grand Ryogoku Bridge crossing it, making a poetic justice to her name and legacy. now, during the lines and colours, you’ll see, particularly in the woodblock paintings, a superb picturesque of the Edo days, like the splendid asian dragon to the nicest Oiran portrait in red-light district. the Japanese folklore plays an interesting role here, from the tales of dragons to the heaven and hell legends. it is good to mention that Miss Hokusai won the Mainichi Film Award for Best Animated Feature Film, and the Excellence Prize at the 39th annual Japan Academy Awards. so, why not go back in time and enjoy this singular masterpiece that retracts the passage from Tokugawa to the Meiji era, from Edo to Tokyo… teeming with life, samurai, nobles, artists, townsmen, merchants, courtesans, and a subtle touch of the unnatural, Miss Hokusai unveils a charismatic page in Japanese history spreading through the seasons, one that you may not want to miss.